Relationships and references between Intrexx data groups are represented in OData as Associations and Navigation Properties. Both 1:1 and 1:n relations can be defined. Relationships with m:n cardinality can be represented with an m:n data group. Associations in OData define the relationships and their cardinality between Entity Types. Navigation Properties, on the other hand, add properties to the Entity Types, which can be used to navigate from a data record to a referenced data record without explicitly needing to add the Foreign key or reference data fields to the Entity Type. The required settings for this are made here. 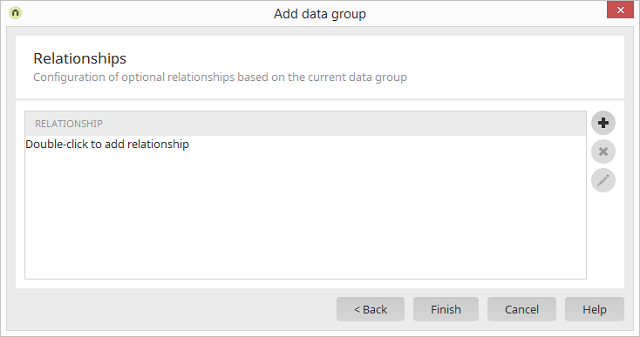 After the data groups that will be available to the service have been selected, the relationships between them can be defined. Opens a dialog where relationships can be selected.